This industrial-duty LCD mount is fully articulated with no less than 4 pivot points and has a 16" standoff from the wall. It is constructed of heavy-duty steel with durable nylon pivot washers and it provides a very sturdy platform with no shake or unwanted motion. Supports between 6.6 and 17.6 pounds (3-8kg). 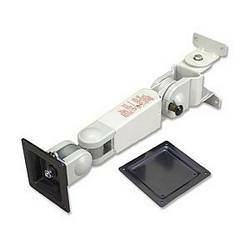 Includes mounting hardware and 100mm adapter plate. Pros: Build quality is nice. Cons: A little hard to swivel, some may see that as a positive. Other Thoughts: Very important: This mount works with the track system SKU 111 0335; however, it's meant to work when the track system is mounted vertically. not horizontally. My set up uses it horizontally and I had to add a spacer to make the setup work correctly. I wish I would have known that before I purchased the mount. Pros: Nice price, swivels in various directions, includes VESA adapter for smaller (or older) monitors. Hardware included for tightening swivel axes. Nice, spacious screw holes. Cons: I have nothing bad to say about this product, I'm that impressed. Other Thoughts: I had to literally put a project on hold because I couldn't find a monitor arm to fold the 14" monitor under the desk when no one is at the security station. This was the only thing I could find and it was a perfect fit. Thanks!! !